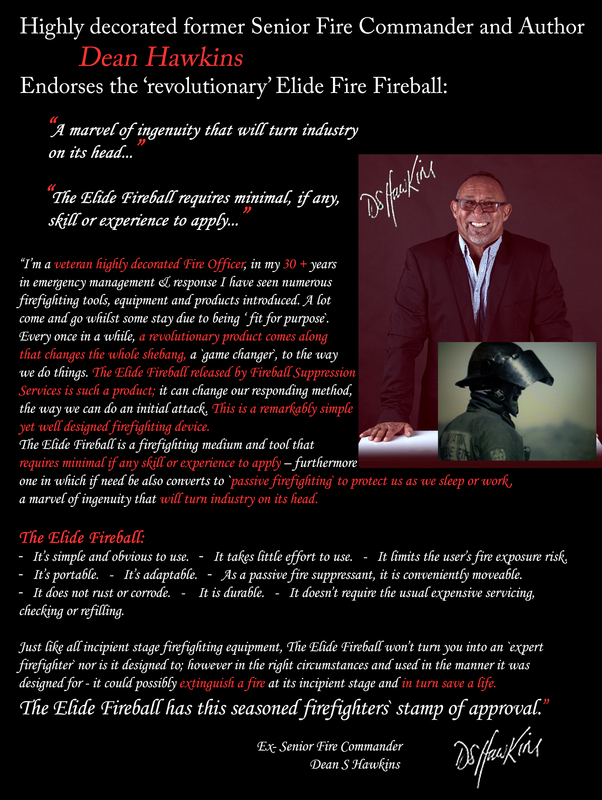 Elide Fire Ball Australia – As Seen on TV! The Elide Fire Ball is a scientifically-proven and effective self-activating fire extinguishing solution for virtually any situation where there is the possibility of an accidental fire. It can be in the home, the office, car, factory, boat, restaurant…in fact, it can be anywhere! How does it work? There are 2 options: If you happen to be near the fire when it starts, simply toss the Elide Fire Ball on to the fire or roll it towards the fire as soon as possible. It will activate within 3-10 seconds and disperse non-toxic chemicals to extinguish the fire. The second option is to position the Elide Fire Ball over or close to the potential source of the fire, such as a stove, an electrical circuit board, a meter box or a computer, using the specially-designed stand that comes which each unit. It will activate automatically by self-detonating when it comes into contact with the fire, even if no-one is around. (You certainly can’t do that with a fire extinguisher or a fire blanket!) unlike the average fire extinguisher it is service and maintenance-free for five years. Unlike a fire blanket or fire extinguisher, you don’t have to be close to the fire to activate the Elide Fire Ball. Unlike a fire blanket or fire extinguisher, you don’t even have to be present when a fire starts! This is because the Elide Fire Ball will self-detonate when it comes into contact with a flame. Elide Australia is the sole distributor of the Elide Fire Extinguisher Ball in Australia. Our mission is to secure and protect lives and property from the hazard of fire. The Elide Fire Ball has won many awards internationally and the confidence of a growing number of customers due to its quality, reliability and functionality. The Elide Fire Ball is an innovative, pyrotechnic, fire extinguishing device, weighing a mere 1.3 kg, with an effective extinguishing range of 360 degrees and up to 4m. No need for prior knowledge or specific training. It is simple to operate and lightweight enough to be used by almost anyone, including children. With the Elide Fire Ball you can extinguish out any type of fire without getting close to the fire and the danger that involves. With the outbreak of the fire, the Elide Fire Ball needs to be thrown/rolled into the source of the fire. A special mechanism activates the ball within 3-10 seconds after coming into contact with fire. The active ingredients inside the ball extinguish the fire immediately. * To operate effectively, the Elide Fire Ball needs to be installed in an open and easily accessible position. When fire breaks out while no one is present, the Elide Fire Ball is activated upon coming into contact with a naked flame (or high degree of heat) and extinguishes the fire at the source – while sounding a loud audible alert (as an explosion) – drawing attention to the danger. * For automatic operation, the Elide Fire Ball needs to be installed 10-30 cm above the spot where fire is likely to combust (e.g. stove or cook top). The Elide Fire Ball can be utilised almost anywhere. Due to its characteristics, using the Elide Fire Ball will be the fastest and most effective method to extinguish or prevent the spread of fire. Possible installations would be in kindergartens, schools, hospitals, home, office, factories, warehouses and even in vehicles. The Elide Fire Ball can be easily placed anywhere: in hallways, corridors, on top of shelves & desks, against the wall or anywhere with easy access. Due to its unique ability to automatically activate when coming into contact with a flame, it is highly advisable to install it near places which have a high tendency to develop ignitable situations such as electrical cabinets, kitchen stoves, heavily loaded electric sockets, gas cylinders and other combustible materials. CLASS A: Ordinary combustible materials such as paper, cloth, wood, rubber, plastic and so on. 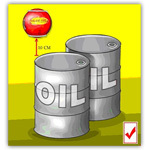 CLASS B: Flammable liquid substances such as gasoline, diesel, alcohol, tar, etc. CLASS C : Electrical – All electrical fire where the electrical component may be either passive or active, such as electrical equipment, fuses, computers, power sources, etc. CLASS D: Gas – all flammable gases. CLASS E: Metalic – light metals such as magnesium, lithium and aluminum and their compounds. The Elide Fire Ball contains dry fire extinguishing powder – ammonium phosphate mono (about 94% active material) – it is a dry chemical fire extinguisher, environmentally friendly and safe for humans, plants and animals. Throwing the Elide Fire Extinguishing Ball into the fire – When a fire erupts, take the nearest available Elide Fire Extinguishing Ball and simply throw it into the fire. The ball will naturally fall into the base of the flame, where it is most needed, and activate within 3 seconds. No need to pull pins, or to get close to the fire. No special training or skills required. Self Activating Mount – One of the great benefits of the Elide Fire Ball is the fact that it can self activate in the presence of fire when no-one is present. If positioned in the appropriate high-risk area where most fires are likely to start, it will self activate upon reaching the appropriate temperature and extinguish the fire. Have the ball always placed at the visible and accessible place. At the starting fire throw/roll the ball into the fire from the safe distance. 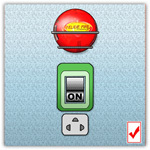 It self-activates after contacting fire up to 3 – 10 sec. and extinguishes the starting fire. In the case of necessity throw more ELIDE FIRE balls into the fire. 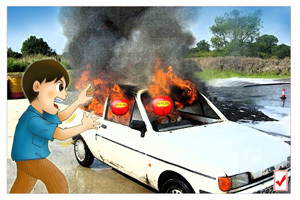 As soon as a fire is spotted, throw at least two Elide Fire Balls into the burning vehicle and move immediately into safe distance. Make sure that the arrow on the product package is always pointing upwards. The Elide Fire Ball self-activates after coming into contact with a flame. It gives a loud audio signal and extinguishes the fire. For more than 12 balls – please click here! How does the Elide Fire Ball work? 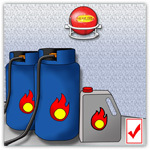 Combustion may occur when there is a combination of three elements: fuel, oxygen and heat. The Elide Fire Ball will activate itself within seconds from coming into contact with flames and release a mono ammonium phosphate chemical powder which separates the three elements and extinguishes the fire. Is the type of powder inside the Elide Fire Ball dangerous? Absolutely not! Dry Mono ammonium phosphate type powder is environmentally friendly and safe for humans, animals, plants and various electrical devices. The ball has passed many safety standards worldwide. Can the explosion noise produced by the activating ball damage, the hearing of humans? 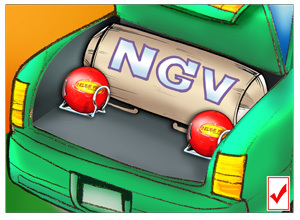 During activation, the fire extinguishing ball produces a loud explosion noise which is rated at 120 decibels. Regarding hearing loss specifically, the noise produced by the Elide Fire Ball is at an acceptable universal level as measured by a variety of global standards institutions. From our point of view, we think that the noise produced is an efficient alert to the existence of a fire. Why do we need the Elide Fire Ball when we already have a variety of other fire extinguishers? The Elide fire ball provides a rapid, convenient and simple means to fight a fire. Simply throw or roll the ball into the fire from a safe distance. The operation is so simple that even a child can stop the fire before it spreads, endangering life and/or property. Will the fire extinguishing ball get activated from exposure to heat only (i.e. no flames)? The Elide fire ball was designed to extinguish fires in similar fashion to a sprinkler systems and the like. Therefore, to avoid false alarms, the ball will be activated only when it comes into contact with naked flames, avoiding false activation as a result of heat, pressure or falling from its cradle. What are the main issues/problems in putting out a fire? Many times fires begin when there is no one around and before long it can cause massive damage to property or worse – become life-threatening. Even when the fire is noticed by someone, it might take precious minutes before an effective means to stop the fire is obtained and utilised. 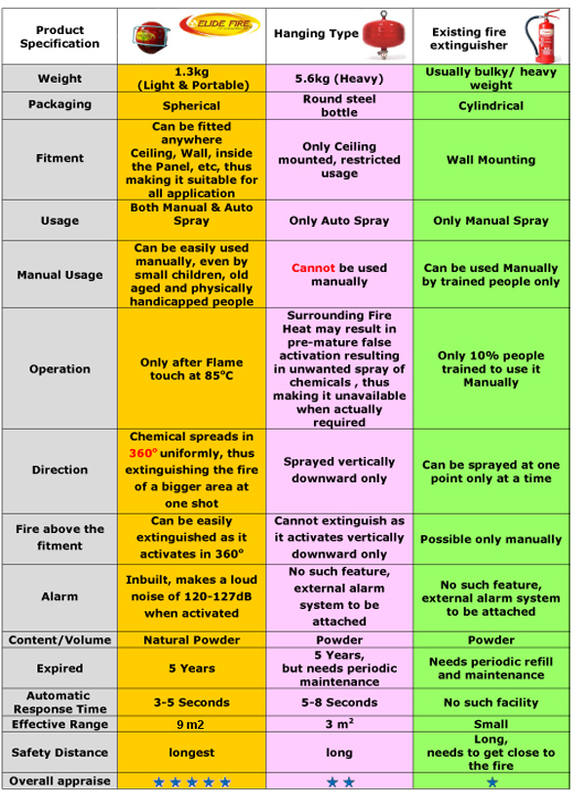 Many standard fire extinguishers are bulky, heavy and not easy to operate especially under pressure. It is also necessary to get close to the fire in order to put it out effectively using standard fire extinguishers. Additionally, sometimes the fire extinguishers in hand are unsuitable to the type of fire e.g. petrol, gas, electrical etc. Even if a variety of extinguishers do exist on the premises, they need to pass periodical inspections to ensure they are effective and safe to use. If such inspections were not carried out within the required time frames, there would be a good chance that they will fail when needed most. What are the most important features of the Elide Fire Ball extinguisher?